The Buddha Shakyamuni is the historical Buddha, founder of the Buddhist philosophy and often referred to as “the Buddha”. 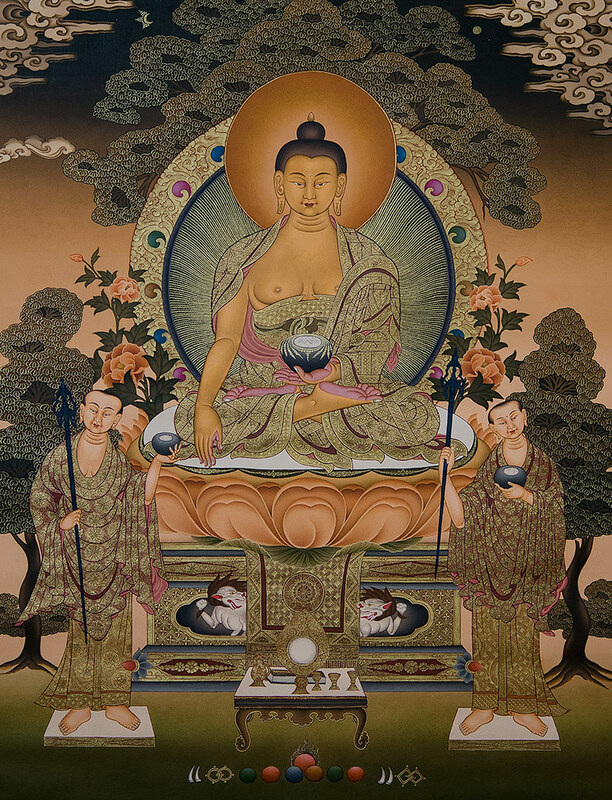 For many, Shakyamuni Buddha, is considered by Buddhist to be a model, a guide and an inspiration. It is said that his presence on earth is ensure by the “dharma” or spiritual belief and by the “sanga” or Buddhist community. Together they form what is referred to as the 3 jewels of Buddhism (Buddha, Dharma and Sanga). There are hundreds of reproductions of these motifs all over the world. Yet, almost every single representation will have a certain number of identical traits. 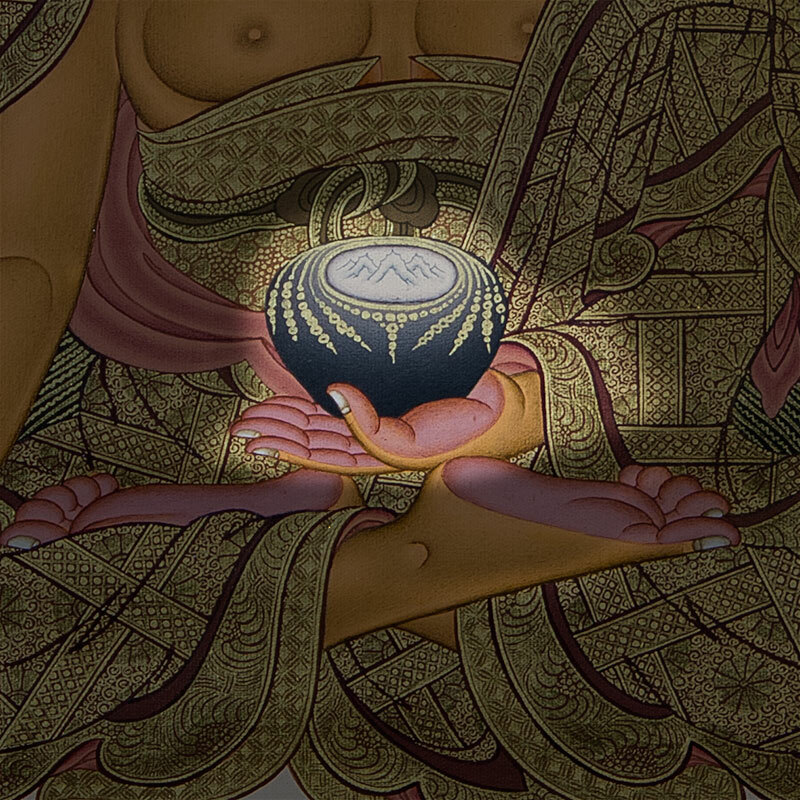 These are what allow us to recognize the different Buddhas and the qualities that they posses. Here we will look at some of the attributes associated with the Buddha Shakyamuni. Painted in shades of gold or beige and wearing monastic robes, he is seated atop a lotus throne on which are symbolically placed the sun and moon. His lotus seat symbolizes the act of living in this world without being soiled by its imperfections. The sun represents “prajna” or wisdom. 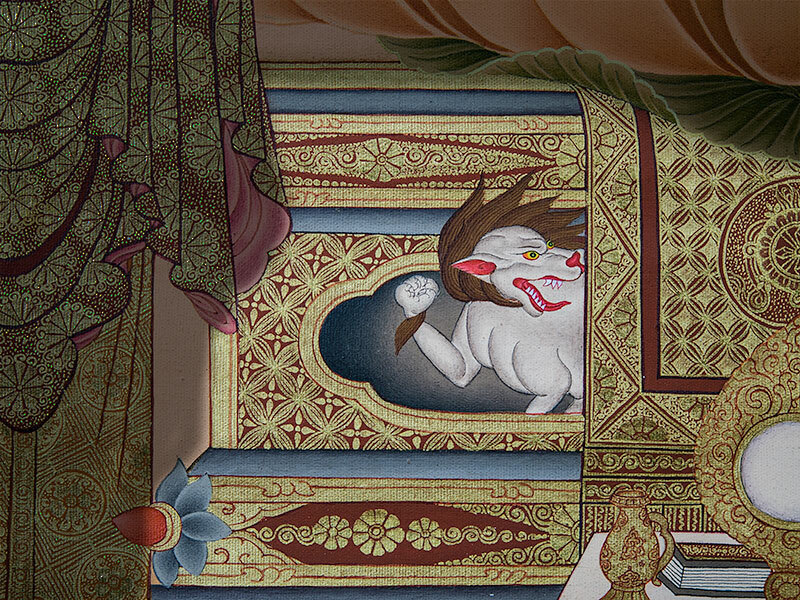 The moon represents “upaya” or the willful means of compassion. The left hand is in the dhyani or meditation mudra. 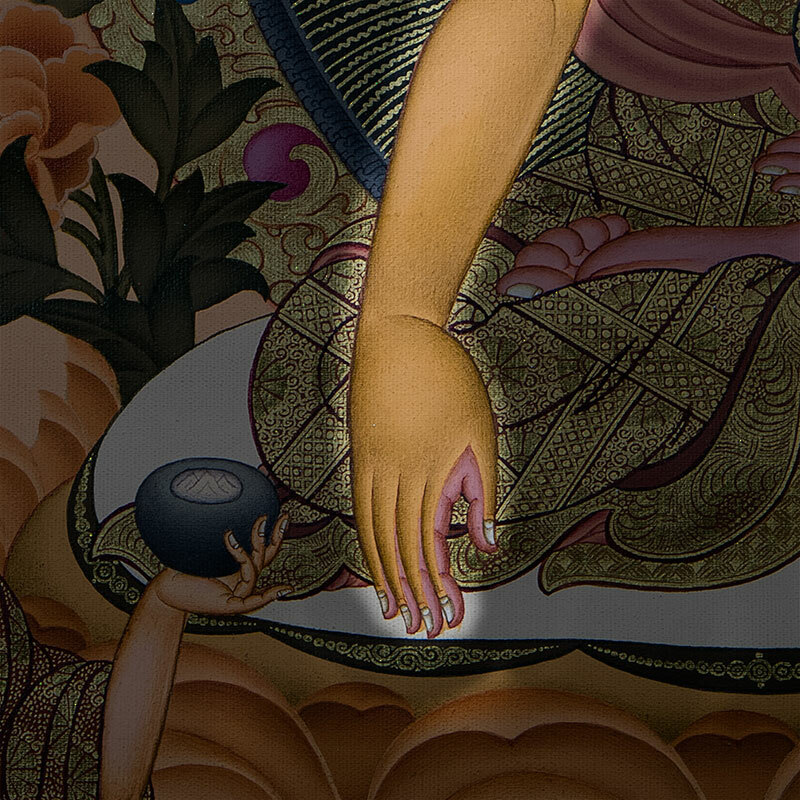 Whilst the right hand is in the position called “taking the earth as a witness” which refers to a particular episode of the Buddha’s Life a thangka detailing his life story. He is often painted with his two disciples, Sariputra famous for his wisdom and Maudgalyayana for his miraculous feats. Both disciples are believed to have been Brahmins who studied the Vedas before being initiated into Buddhism. The Buddha is often, but not always, represented on a throne supported by two lions. Just as lions are thought to be the kings of the animals, Buddha too is a king amongst the divine. We can sometimes see an extravagant backrest, containing 6 mystical creatures. This makes reference to the six paramitas or the six perfections, the principal qualities required to attain Buddhahood.